Dr. Leonard Giunta is a man of many talents, but today we’re chatting (mostly) about his Gay Street furniture business. So, how’s a doctor end up running a furniture business? Well, for years I’ve developed real estate, and I had a piece of real estate in Exton where two people who rented from me sold furniture. As they started selling more, they wanted to expand, and they asked me to partner with them. A long story short, they were supposed to be the experts, but I quickly found out they were not as educated in the business as I’d hoped. It was going nowhere, so I decided to buy them out. That’s when I started the first Giunta’s Furniture in Exton. 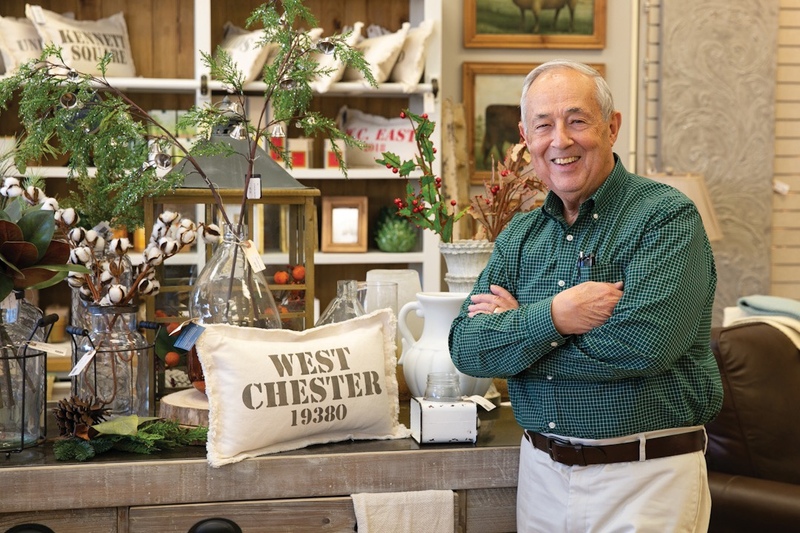 What brought the business to West Chester? I’ve always loved West Chester. As you may know, my father had a grocery business here for 50 to 60 years. West Chester didn’t have a furniture store, and I had a piece of real estate in Gay Street Plaza that was big enough to start a store here. Both stores have seen significant growth in the last three years. My daughter Jenny is the manager here in West Chester, and we really know the business now and have developed a lot of recurring customers. How do you go about competing with online retailers and big-box stores? We’ve found success by being unique — that’s why we sell furniture, and accessories and gifts. Furniture can be a large investment, so people don’t buy it all that often. We wanted to find a way to bring people in on a daily basis. Gifts and accessories are purchased more regularly, which brings people through the door. It’s been a very successful combination. Are you also a practicing doctor? Yes. I practice family medicine.And a real estate developer. For about 40 years now. Have you dabbled in any other projects along the way? Many. Because of my background as a physician, I had the opportunity to become a founding partner in Jackson ImmunoResearch, a company that produces immunoproteins for the medical research community. I also bought another company about five years ago called Proper Nutrition that sells nutraceuticals that are used for IBS and hypoproteinemia. Is furniture your newest endeavor? Nope. I recently bought a 20-acre farm in Marshallton raising sheep and selling them to market. That’s a pretty diverse background. So, why furniture? I liked it — I enjoy retail. As a doctor, if I’m not working, I don’t generate any money. In stores, with good managers, I can still grow without being directly involved all the time. Plus, I love West Chester and having retail businesses helps the community flourish. By keeping people spending their money here in town, we all benefit. This community is important for all of us.